Nothing can be more appeasing than knowing that you have someone around who is always ready to support you on your goals and personal well-being no matter what. That someone whom you can trust with confidence, whom you can talk to when you need someone who’ll listen, one who can provide you with personal services with gentle compassion and utmost understanding. These are the people you can rely on when the most struggling challenges take place. And that, we provide with no discretion at Carolina Care Solutions LLC. You deserve it. A certified nurse assistant is halfway between both a companion and a homemaker. 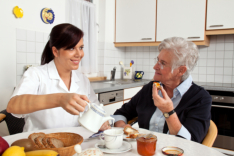 They provide specific services at home, dedicated solely to the subject of care. They are responsible at placing, organizing, and establishing things around the house to help the patient settle in the most comfortable and pleasing manner. Certified nurse assistants also are in charge of personally assisting the patient in both his/her small and quantifiable endeavors and make its end successful. Their goals are singularly focused on you. Please direct all inquires to 704-770-1862 or 843-855-1384. For questions, comments, and suggestions, you can leave us a message online.